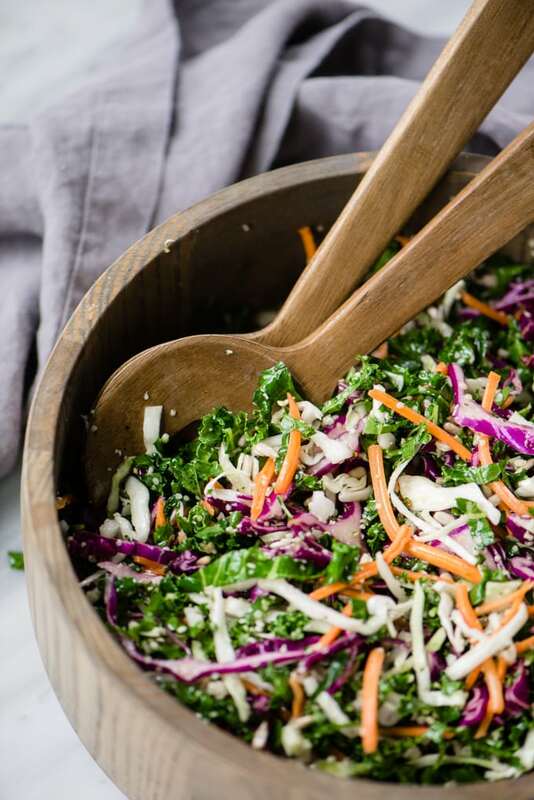 This colorful and crunchy kale slaw is super power food! It’s packed with tasty, good-food-you plant based protein, vitamins, and antioxidants, plus it’s pretty darn easy on the eyes. 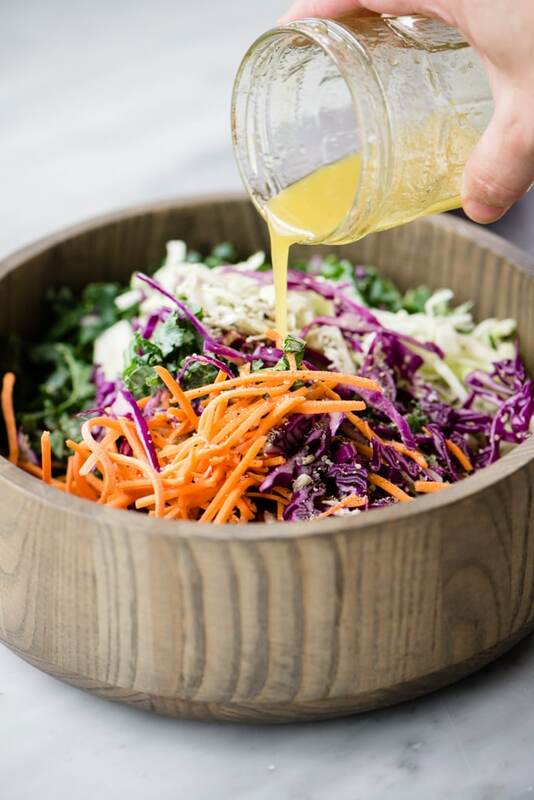 This salad (or slaw) is ready in just 20 minutes and the perfect meal prep recipe to have on hand all week. Use it as a slaw for paleo tacos or pulled pork, or serve it as a gluten free dinner salad with grilled chicken or fish. So versatile, so delicious. Shredded cabbage and carrots? Apple cider vinegar dressing? Yes, it’s totally a slaw. No, wait. It’s got kale too. Mmmm, kale. And crunchy bits. It’s a salad. 100% a salad. No, no, no – it’s all shaved and delicate. It’s definitely a slaw! That was my internal monologue when I pulled this recipe together and I’m totally fine with the outcome because two-for recipes are the best! Make it once, use it all week. Versatile, healthy weekend meal prep is my jam. Also pretty things are my jam. Healthy pretty things. Pretty healthy things. It all works. 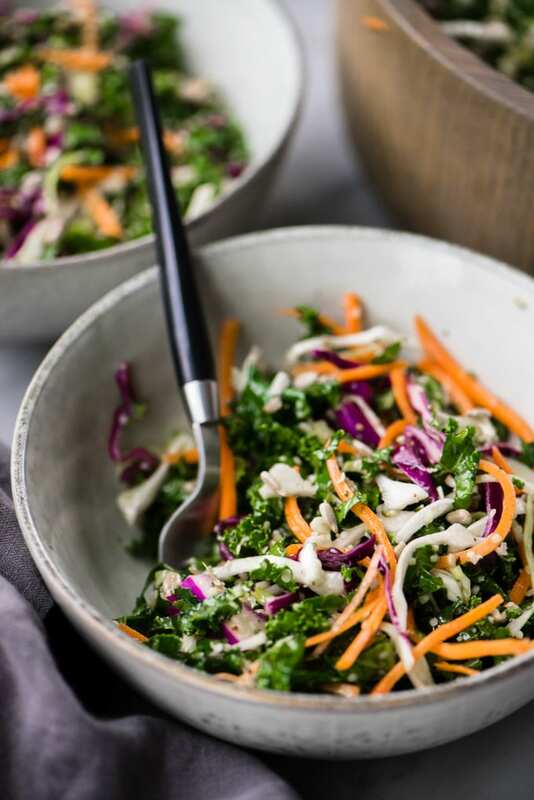 Aside from being super flexible, this crunchy kale slaw is totally tasty and nutrient dense. It’s packed with tons of vitamins and antioxidants (seriously all of the Vitamin C and A!) and a healthy dose of plant based protein (10 g per serving – woot!). Also it’s crunchy. The crunchy bits really make it special. PIN IT NOW! 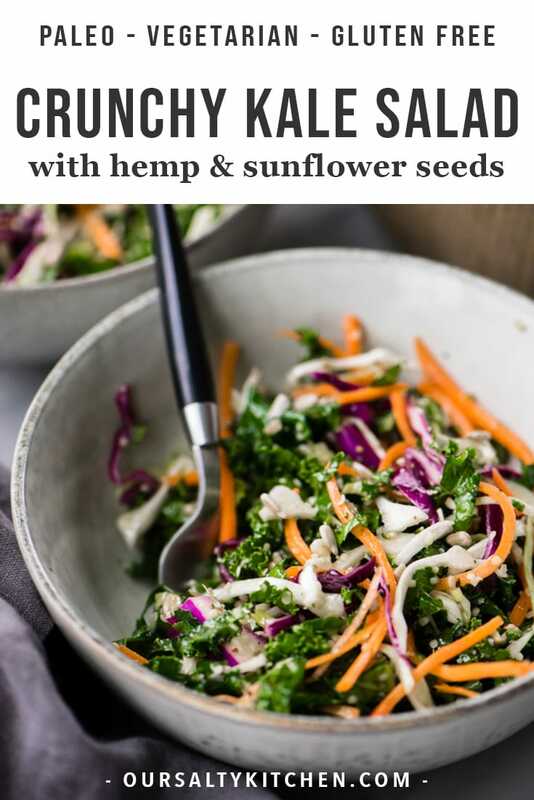 CLICK HERE TO SAVE THIS CRUNCHY KALE SLAW TO YOUR HEALTHY SALAD OR SIDE DISH RECIPES BOARD ON PINTEREST. Ya got 20 minutes and a sharp knife? Or 10 minutes and a vegetable mandoline? Cool. 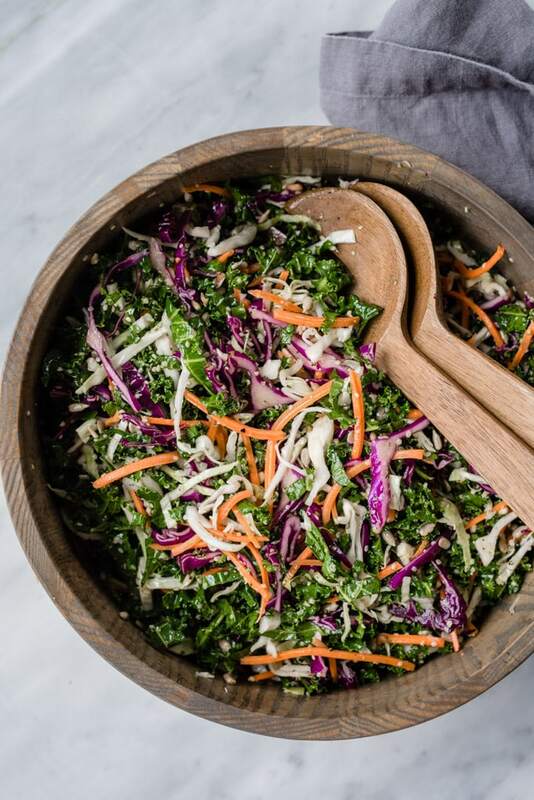 Then you have the time and tools for this crunchy kale slaw (or salad). First things first, get your hands on some fresh kale. Curly or flat, chef’s choice. I used curly because I already had it on hand for smoothies. Remove the stems from about, oh, four or five leaves. 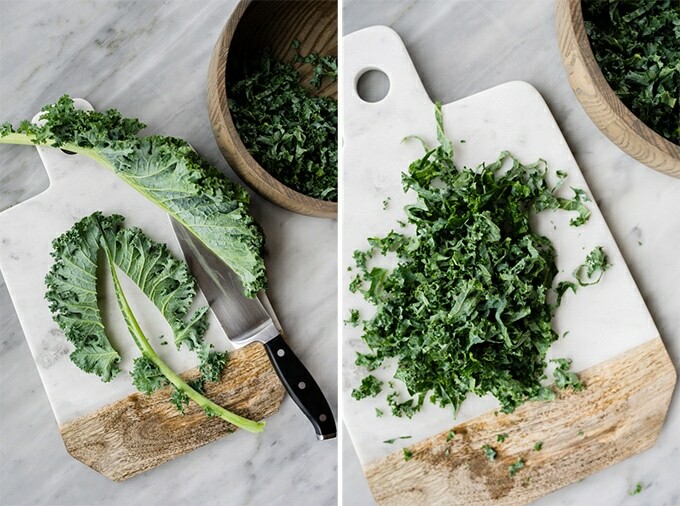 Then stack the leaves on top of each other, 2 or 3 at a time, and thinly slice the kale into ribbons. Toss those guys into a bowl. Then add some cabbage. Red. Or green. Or both! Again your choice, but more diversity = more nutrition, so I highly recommend both. I thinly sliced the cabbage with a very sharp knife since I already had it out, but a mandoline’s going to get the job done much more quickly and you’ll get thinner slices. So if you have one, use it. Or you can be super smart and buy pre-shaved cabbage. I won’t tell. Throw in some carrots. Crunchy kale salad (or slaw) base established. Let’s get even crunchier! And more protein-ier! Toss in some hemp seeds and sunflower seeds. I’ve been rocking hemp seeds for awhile now but I feel like I’ve been throwing them into nearly everything lately. Salads, smoothies, and now this slaw. So what are hemp seeds? Yes they’re from the pot plant. No they won’t get you high. Hemp seeds, or hemp hearts, pack a very healthy punch of both protein and fiber. They’re also a concentrated source of calories, so I toss them into salads, smoothies, and slaws to fill me up and keep me full. They don’t have a discernible flavor, but they do have a nice little crunch. They’re also pretty cheap. Economical, nutrient dense, and crunchy? That’s a win. Dressing time. We’re keeping it super simple with an apple cider vinaigrette. Combine, shake, pour. Simple and easy. Now toss! 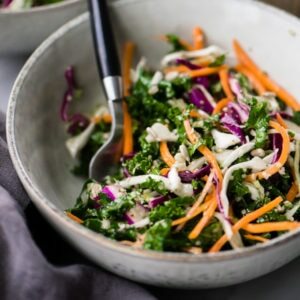 You can eat this slaw right away, but it definitely improves with a little marinating time, especially if you’re using a flat leaf kale like lacinato that needs a little coaxing to help the plant fibers break down. We had this for dinner as a salad with grilled chicken and it was super filling. I’m usually reaching for a little something extra when I have a dinner salad, like a handful of berries or a little cheese, but I was completely stuffed after this. Serve it with chicken tacos, or pulled pork sandwiches or wraps, or enjoy it all on its own as a side dish. Dust it with some extra hemp seeds and you might even be able to get away with having it on its own for a light lunch. 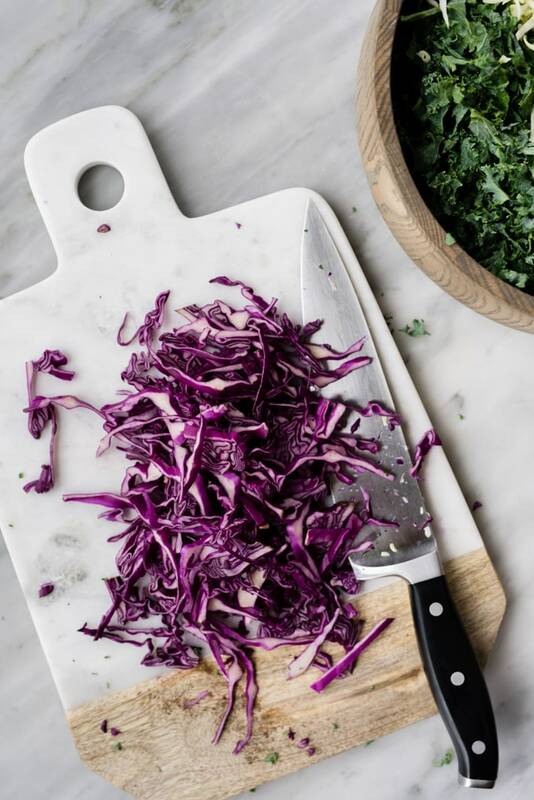 This slaw…or salad…will keep in the fridge for at least 4 days. DID YOU MAKE THIS KALE SLAW? 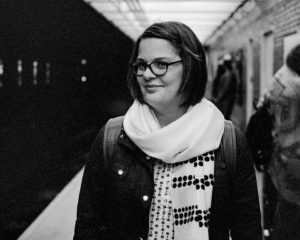 I WANT TO SEE YOUR CREATIONS! SNAP A PICTURE AND SHARE IT HERE ON PINTEREST. 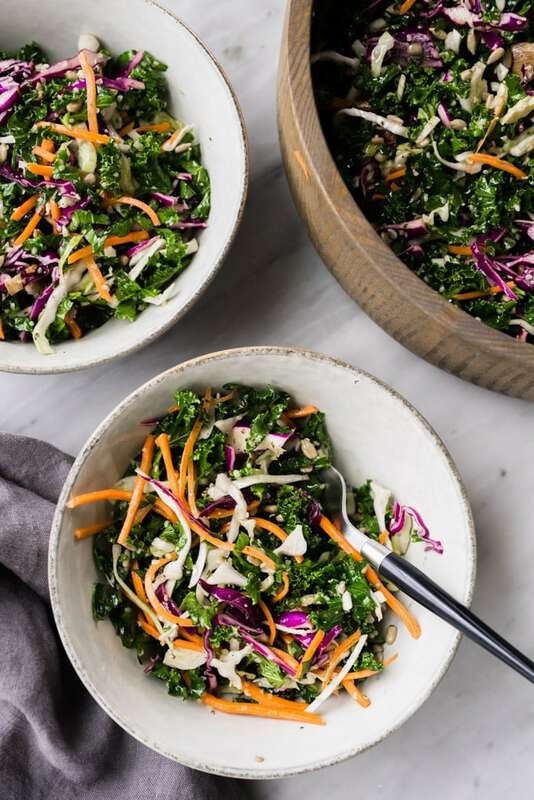 This crunchy kale slaw is perfect for meal prep Sunday! Use it all week as a taco topping, side dish, or dinner salad with chicken. Versatile and delicious! 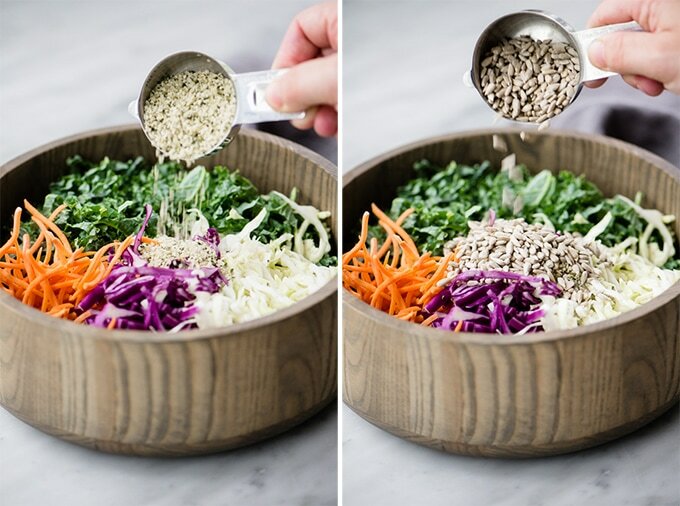 Combine the shredded kale, cabbages, carrots, hemp seeds and sunflower seeds in a large bowl. Toss. In a small, lidded jar combine the olive oil, apple cider vinegar, honey, salt, and pepper. Shake until the vinaigrette is emulsified. Pour the vinaigrette over the slaw. Toss throughly to combine. Serve immediately as a side salad or as a topping for tacos or pulled pork. 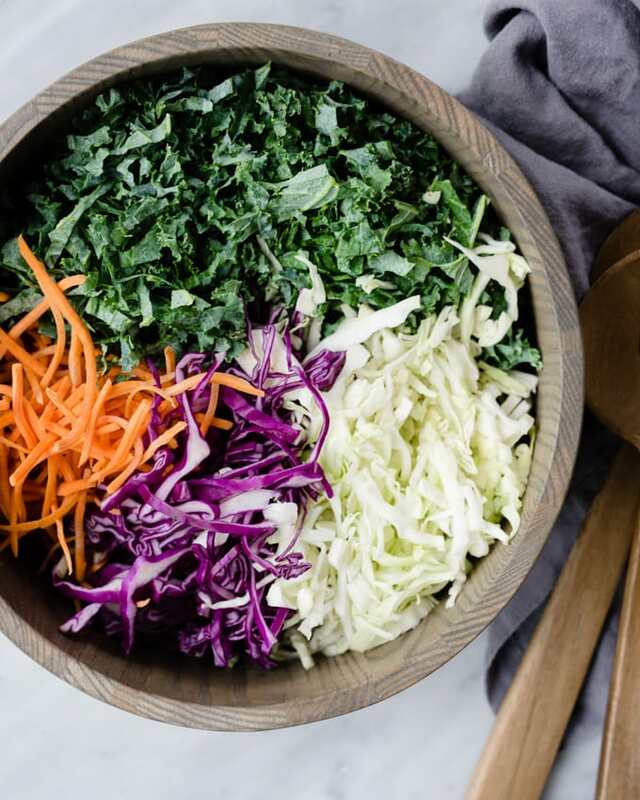 Kale slaw keeps in the fridge in a tightly sealed container for at least 4 days, and up to a week.